“Seeing the joy on the people’s faces who have called Huntington home all their lives made me appreciate the area more and makes me even more to call Huntington University my home,” Blaire Koomler said. 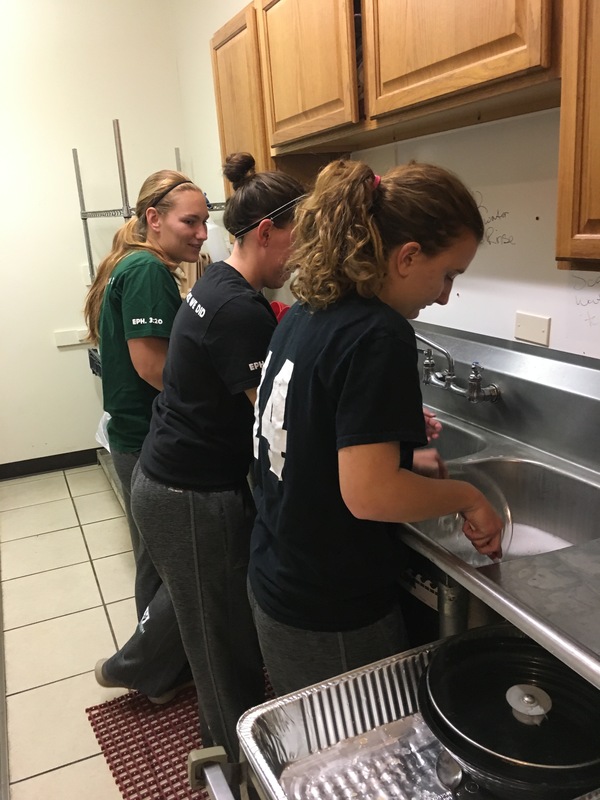 A few members of the HU women’s soccer team put into practice one of their university’s core values—service—this Sunday night. Six players volunteered at New Life Ministries, helping to prepare and serve a meal to community members. After spending a season on the field serving one another, the team has been seeking chances this off-season to spread their service into the greater Huntington community. Koomler, an Allen County native, said getting off campus and into the community gave her a new perspective on the city. “Seeing the joy on the people’s faces who have called Huntington home all their lives made me appreciate the area more and makes me even more to call Huntington University my home,” she said. The girls also bonded together through the experience. Under the director of Amanda Burge, who just wrapped up her first season as head coach, the team has renewed its focus on service. Junior Morgan McClougan said Burge has provided many opportunities for her team to invest in the community around them, preparing them for a service-focused life after graduation.